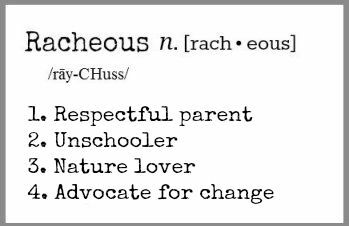 Hi, I’m Rachel and welcome to Racheous! I’m a wife to my highschool sweetheart and a mama to Cameron, Lucy and Ava. I respectfully parent and we learn without school. I am a passionate advocate of children’s rights. You may have found me through my prior interest in the Montessori method. We are now unschoolers. This is my space to express myself and share. You can find us on Facebook, Instagram & Pinterest. What a beautiful, honest and open “About Me”. We had 3 miscarriages before we conceived our youngest Quentin and we spent his entire pregnacy trying not to miscarry him. Two of the miscarriges were “little” ones and one was a “big” one. How wonderful of medical staff to label our loss in this way. I have only managed to write a little about it on the blog (“Happy Unbirthday”). What a brave woman you are to share with us your thoughts! I experienced some anxiety disorder too ,that eventually caused me a heart problem. I have been on some kind of medication ever since in order to make my heart works a little better. It does work better but we’ll see! You have a great blog here and a great family! I also have a daughter born in 2009 who I love very much. Keep up the good work,nice to meet you. I appreciate your comment, thank you and nice to meet you too Xrusa. Just found your blog today and am looking forward to reading more. I have three children (2 year old, 1 year old, 7 month old) and am seriously considering homeschooling so I’ll be gathering some ideas for sure. As far as homeschool co-ops go, how do you go about finding a co-op directory? I’ve searched, but had little luck. I’d love to go check out a few in my area (Sydney)! I am considering homeschooling my boys, and have been pointed in your direction. Looking forward to listening and learning from you. Hi Racheous! I just stumbled upon your name on a blog I follow and recognised your name instantly! My husband and I used to watch your vlog. We experienced an early miscarriage before our firstborn and your vlog really helped us through. So thank you very much! We now have 2 beautiful girls (nearly 3 and nearly 1). I’m looking forward to looking through your blog. Just found your blog and love reading about your life. Thank you. Hi Rachel, I stumbled upon your blog on Bloglovin. I love your writing style. I love that you are so open about yourself and your family. Looking forward to read more from your blog. Me too! My kids are 5 and 2, so excited for this unschooling homeschooling journey. I really love this blog. I am a 12 year old girl who feels like we are not treated like people. I reccommend your articles to my friends who feel the same way, and I admire how you are not afraid to talk to your kids the way that they should be talked to, and that the eye rolls and weird looks don’t stop you. This blog is definetly one of my favorites. The funny thing is that, people who meet me talk to me like I can hardly understand what they are saying, and that only grows when I tell them that I am a vegan (which is quite rude, but you get used to it) and then when I am forced to tell them my IQ (because someone who knows me always mentions that I have an impressive one). The more I talk, the less they listen, but they find nothing wrong with talking to my mother about me when I am standing right there. “Oh, she has such a strong vocabulary for a child!” “Wow, she talks as though she is an adult.” “How do you ever get her to behave since she is such a smart aleck?” “Well, she is only a kid, so it shouldn’t be too hard to keep her in line.” After a few of these, I am standing there with my jaw dropped, not really sure what to do. My family knows I am intelligent, but people really need to understand that as well, with all kids. Hi there, excellent article. Really enjoyed. What a happy family and your children are so adorable! God bless you for helping us do our best for our children.